Patient-reported outcome measures (PROMs) are tools that are widely used by clinicians and researchers across different medical specialties. In this review, we examine the use of PROMs in the evaluation of female pelvic floor disorders (PFD). PROM development in the assessment of urinary incontinence is more advanced than other pelvic disorders. Work is ongoing in the scientific community to improve currently available measures and create new robust tools where needed. Hundreds of PROMs are available for use in the evaluation of PFD, some more rigorously validated than others. They are used to screen for diseases, evaluate their impact on quality of life, determine the results of treatment, and measure patient’s satisfaction with treatment. Careful consideration is required to choose the appropriate PROMs to care for a patient or include in a research study. 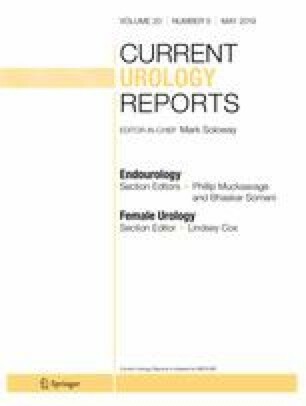 The topic was reviewed in the Textbook of Female Urology and Urogynecology published in 2017. We reviewed recent literature (2015–2018) on the topic and summarized our findings. Engy Habashy and Ayman E. Mahdy each declare no potential conflicts of interest.